No Brussels sprout preparation I've tried, roasted, sauteed, sweet, spiced, has convinced the Mr. to eat these little cabbages. But I don't let sprout prejudice stop me from enjoying them. Yes, they do have a slight bitterness to them, which can be lessened with the right preparation, but it doesn't bother me any more than bitter salad greens like kale and arugula. 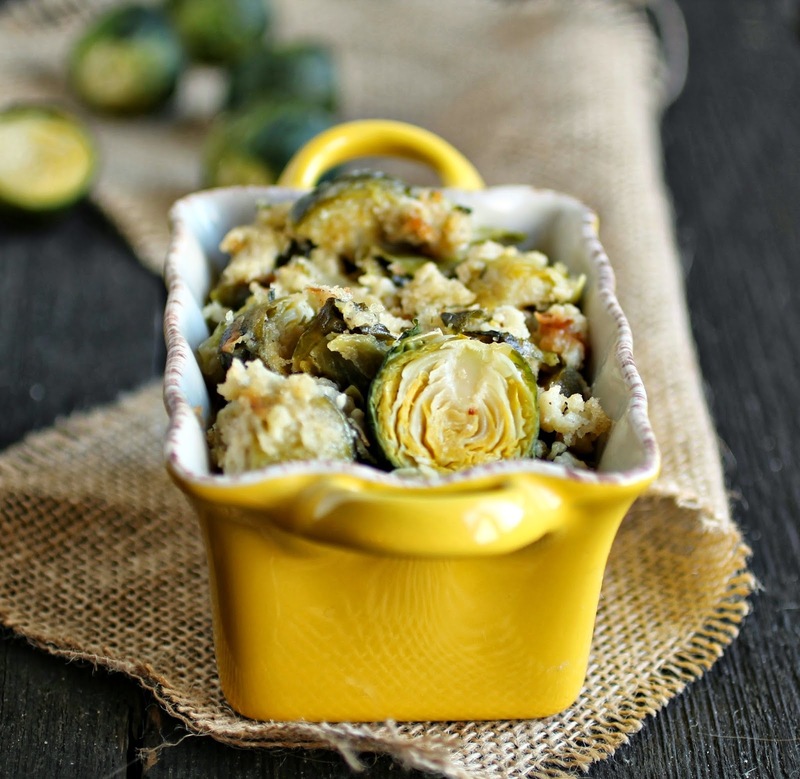 I'd never tried making a Brussels sprout gratin before but it was only a matter of time. Because I've mastered making a lightened up sauce, gratins don't have to be a rare indulgence anymore and I love experimenting with different flavors and ingredients. It was definitely time for the sprouts to take their turn and I was pleasantly surprised. Not only do they hold up well but the natural sweetness of the dairy eliminates most of the bitterness. This is definitely going into side dish rotation around here, even if it's just for me. Enjoy! Bring a pot of water to a boil and add the Brussels sprouts. Cook for 5 minutes, drain and set aside to cool enough to handle. Add the tablespoon of olive oil to a large saute pan, heat and whisk in the flour. Reduce the heat to medium low and slowly whisk in the milk. Continue whisking for a few minutes until the mixture begins to thicken. Remove from the heat and add the cheese, nutmeg and garlic powder. Season with salt and pepper to taste. Cut the stems off the Brussels sprouts and slice in half or quarters depending on how large they are. Add them to the saute pan. If your pan is oven safe, you can use it to bake the gratin or spoon the mixture into separate dishes, if you like. I baked mine in individual gratin dishes. 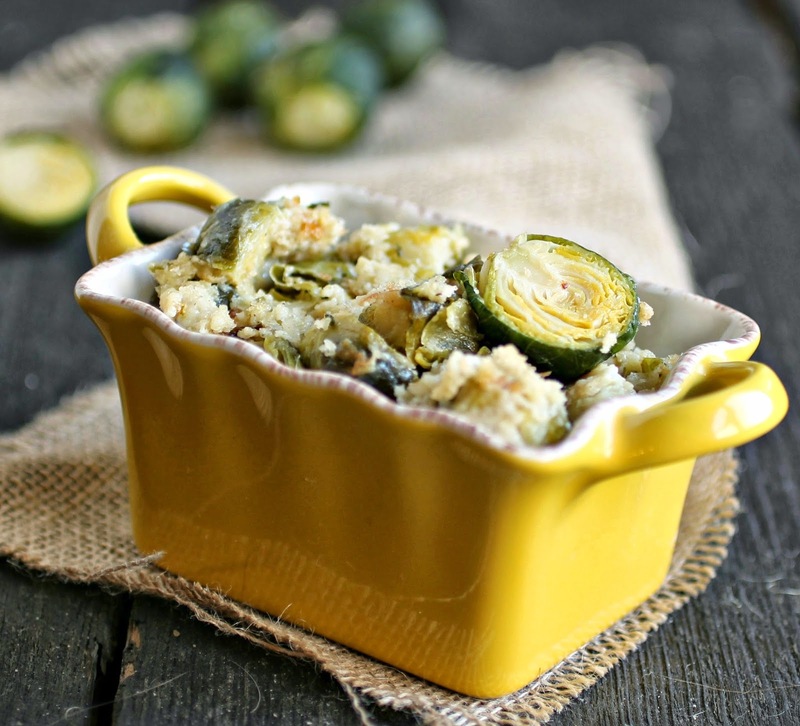 Combine the breadcrumbs with the olive oil, mix well and sprinkle over the top of your gratin. Bake in a pre-heated 400 degree oven for approximately 20 minutes or until the top is a light golden brown. Makes 2 - 4 servings. Squirrel and I love brussels sprouts. I haven't had them slathered in a cheesy cream sauce, so that totally needs to happen. This recipe looks delish. 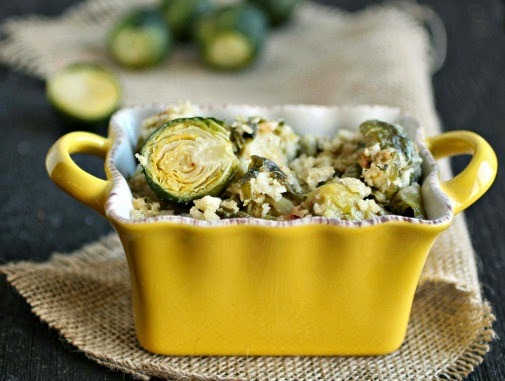 I am a sprout lover, but this cheese sauce would make anything taste amazing! Hey this looks very similar to your broccoli gratin I tried! My whole family gobbled that up. Think I can convince to eat this one too? I had a Brussels sprouts gratin at a restaurant not too long ago and it was awful. But the concept was great and got me craving a good one. I'm so glad you shared this recipe so now I can make it and satisfy the craving. OK, you've convinced me to try Brussels sprouts again. Anything with a creamy sauce has to be good!